I would like to shout out loud to all my beloved readers! Those who are from Penang, come and join me & Triumph team for this Manic Day Of Shopbra Haul Challenge at Ground Floor Concourse, Extension Wing, Gurney Plaza on this Sunday (26th June 2016) at 1pm. Usually, most of us (girls) always buy clothes and accessories, this time let's we together buy our favourite bras & underwears from Triumph. Furthermore, there is fitting consultation to find the perfect fitted bra for yourself. It gonna be fun event for those ladies out there. The promotion is available at Triumph counter, Parkson Gurney Plaza from 22th June - 26th June 2016. To my beloved readers, remember to purchase RM 1,200 above within that period to entitled to join "Manic Day of Shopbra Haul Challenge" on 26th June 2016 with your girlfriends. You will have to bag as many as bras as you can within 30 seconds! You will also have a chance to confess their shopaholics experience and the best 3 will win fabulous prizes. OMG!! I really can't wait for the event!! See you all there!! Challenge yourself to bag home the most bras within 30 seconds! Manic Day of ShopBra Haul Challenge! Be our TOP 3 CONFESSION WINNERS! 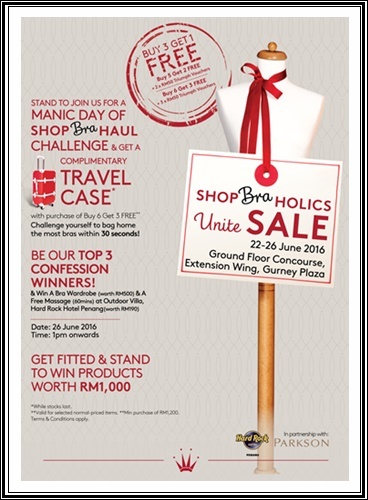 Get fitted & stand to win products worth RM 1000!! !